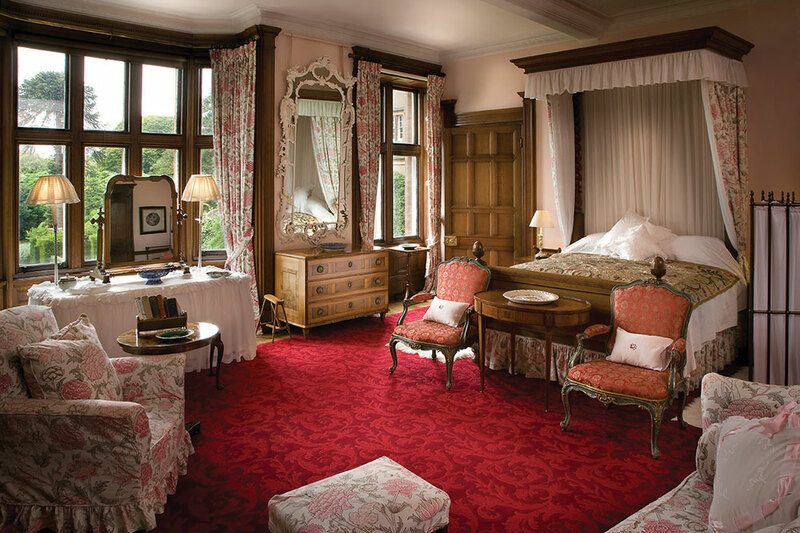 The images here are available to use on websites and by journalists working for the press in connection with articles relating to Holker Estates and its businesses. Use of images must be accompanied by the credit line: © Holker Estate unless otherwise labelled. Click on the ‘download’ link to get a high-resolution copy of the image. The image will open in your browser, from where you can save it. 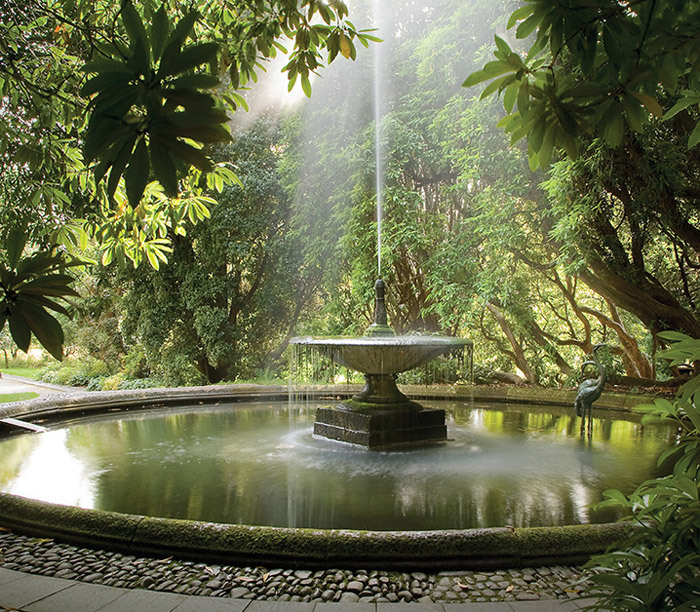 If you require a higher resolution image or wish to publish it in a book, please telephone 015395 58328. The Library contains some 3,500 books, many of which survived the fire and others that were subsequently brought from Chatsworth. 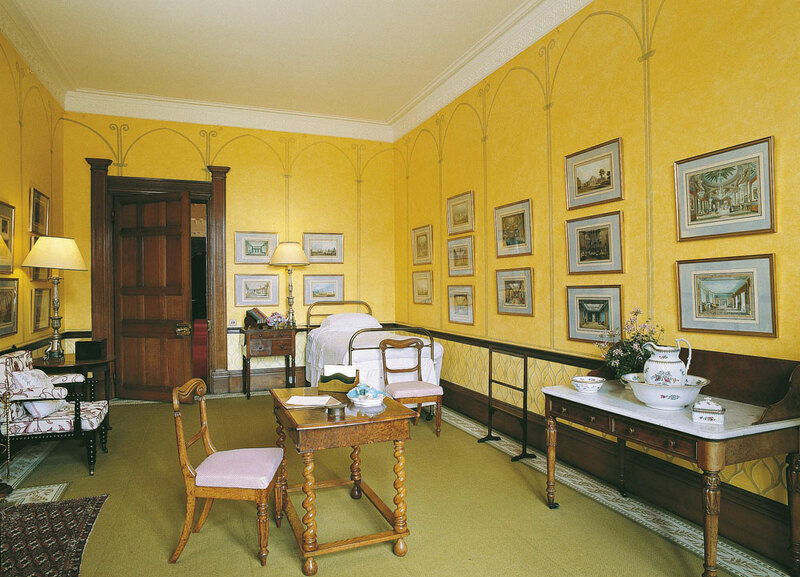 The walls are covered with the original silk, hung after the rebuilding of the New Wing. 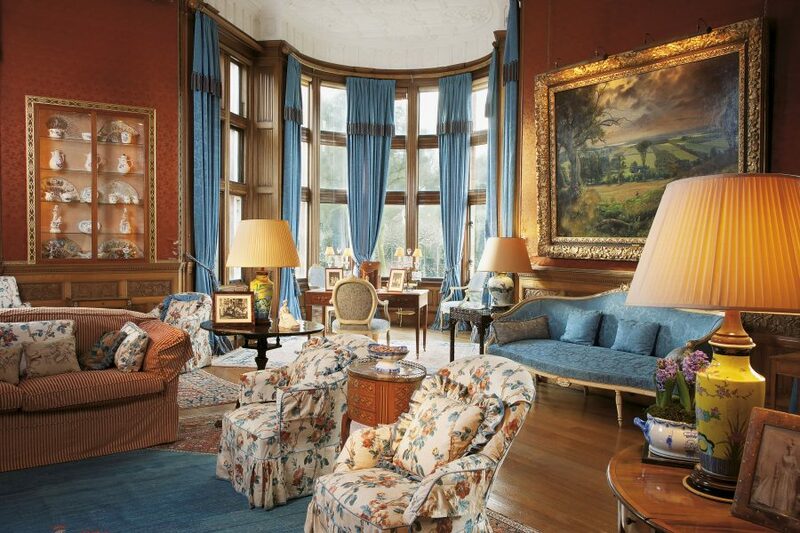 The furniture is of varying dates and styles which includes; Hepplewhite sofas and chairs, a Chinese-style Chippendale table with clustered column legs, a Dutch seventeenth-century inlaid table and a Chippendale silver table on which lies a book on Buckingham Palace that was presented to Lord Richard Cavendish by Queen Mary after her visit to Holker in 1937. There are several pictures of interest in this room. The four large panels are attributed to Jacques-Charles Oudry. Between the windows hangs an interesting caricature by Sir Joshua Reynolds (1723-92), the first President of the Royal Academy, of four English visitors in Rome. They are Sir Charles Turner in regimentals, Sir William Lowther, who owned Holker, in blue, Lord Miltown in brown and Mr Huet. 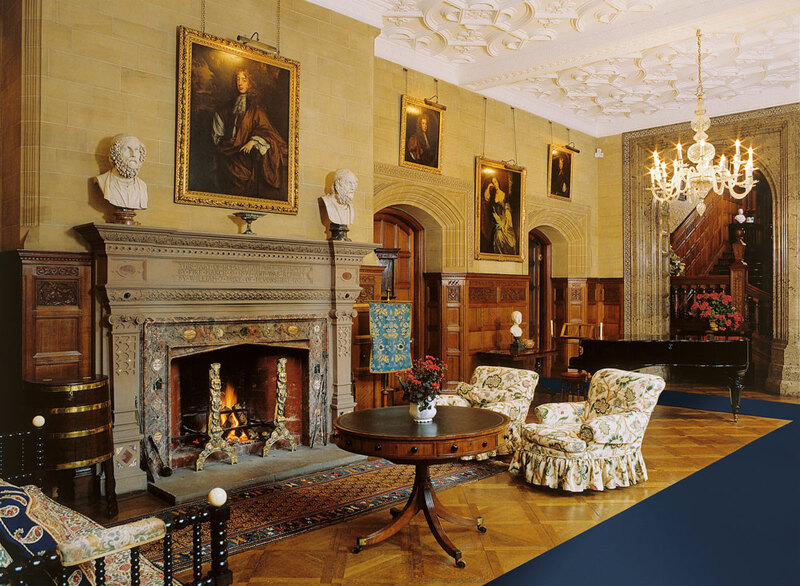 The four twisted columns of the magnificent fireplace were carved by a local craftsman from estate-grown oaks. The theme of twisted columns can be seen in various instances throughout the house as well as in the choir screen of nearby Cartmel Priory, where they form part of the restoration work carried out by George Preston. The staircase is reached through an archway of polished limestone that was quarried on the Estate at Stainton, near Ulverston. 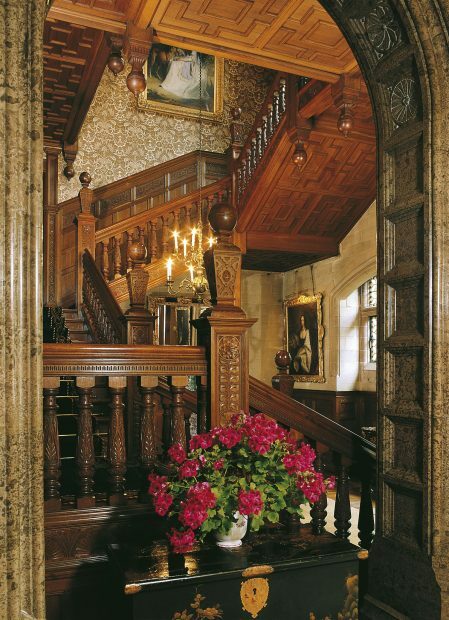 The oak staircase is built on the cantilever principle, i.e. 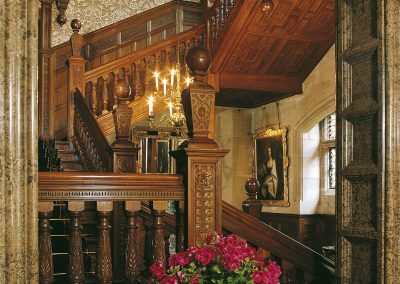 it is self-supporting and each of its balusters – of which there are about 100 – is carved with a different design. 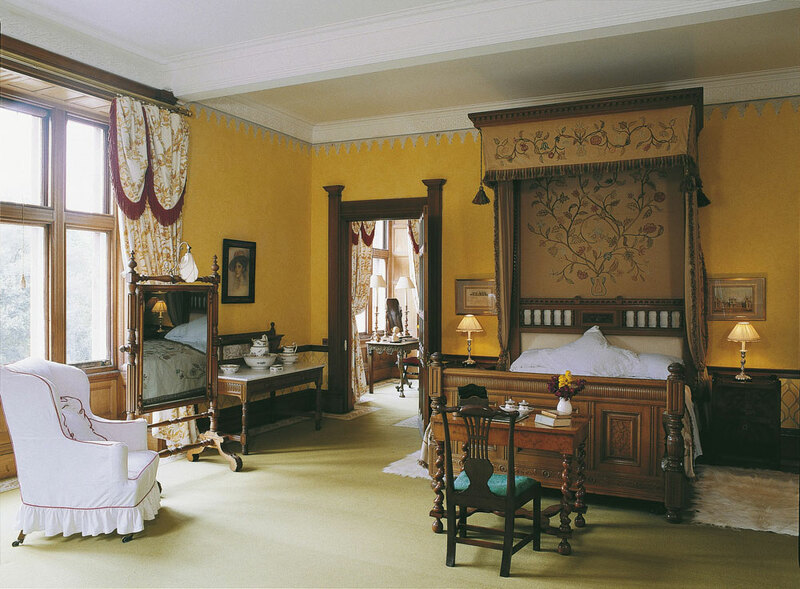 It is a magnificent tribute to Victorian craftsmanship. 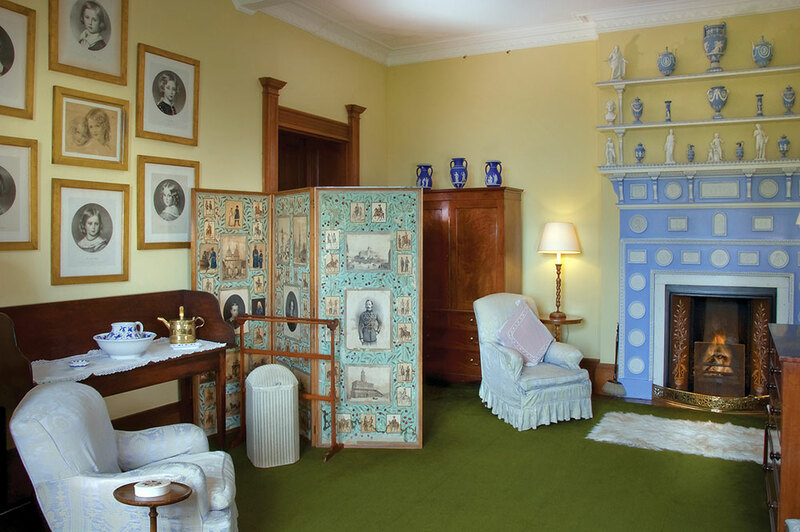 The Wedgwood Bedroom gets its name from the collection of blue and white Wedgwood Jasper ware in the Dressing Room. 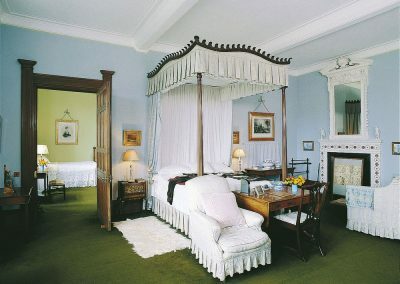 Above the Carrara marble fireplace is an early Georgian looking-glass surmounted by a broken pediment enclosing a shell. 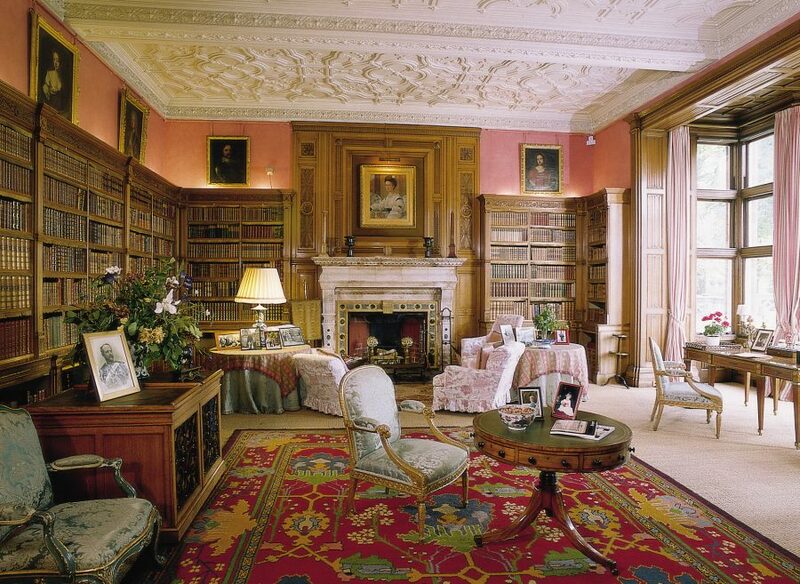 The firescreen incorporating the initials R & M was worked by Lady Moyra on her marriage to Lord Richard Cavendish. 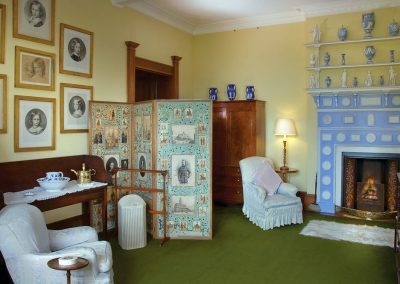 The unusual fireplace, which holds a collection of blue and white Wedgwood Jasper ware, accounts for the name of the bedroom. 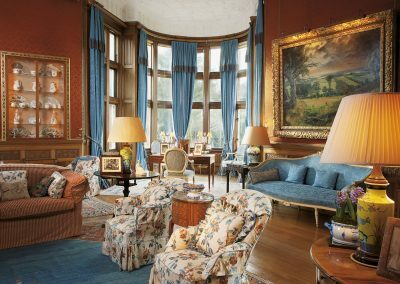 It was probably brought from Montague House by Lady Louisa at the same time as the Drawing Room chimneypiece. 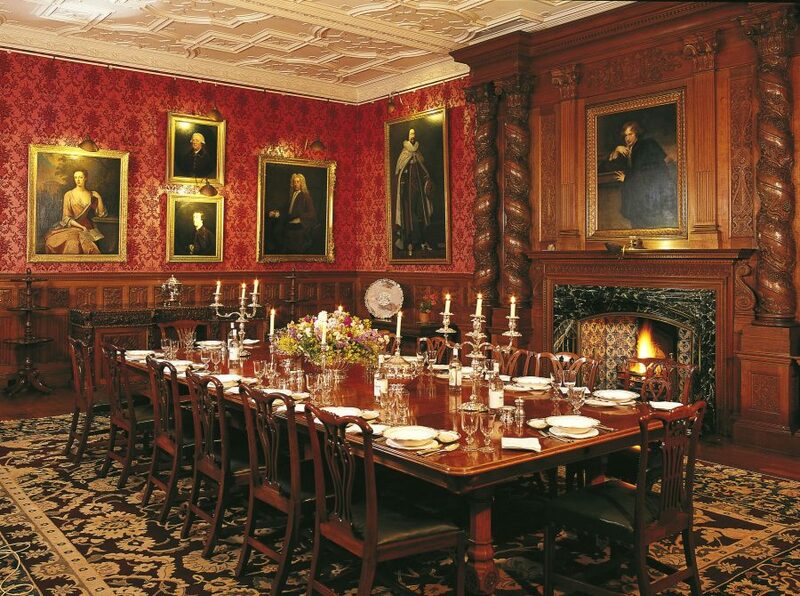 It was in this room that the disastrous fire began on 9 March 1871. 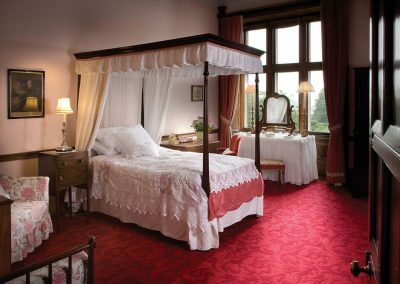 The bed is a small Hepplewhite four-poster, and the fireplace with Tudor panels is thought to have come from nearby Kirkby Hall, which passed into the hands of the Cavendish family in 1719. 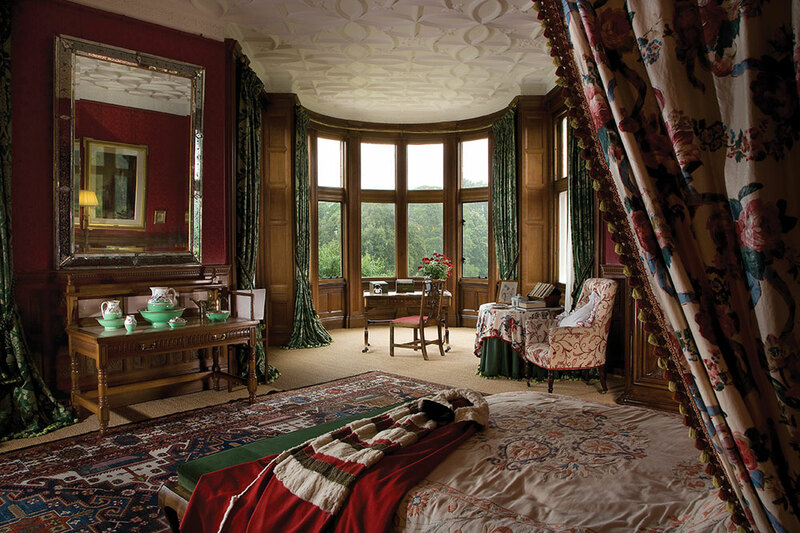 This room was occupied by the 7th Duke of Devonshire during the last years of his life. 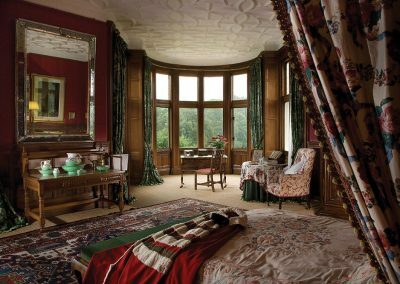 Holker remained his favourite home even after he had inherited Chatsworth and all the otherDevonshire houses. 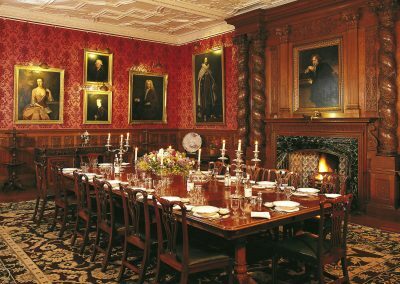 The monogram in the panelling spells out his name, William. 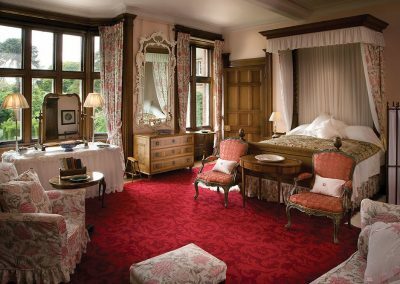 This room and the adjoining bedroom were used by the Duke and Duchess of Gloucester, the younger brother of King George VI, on their visit to Holker in 1939. 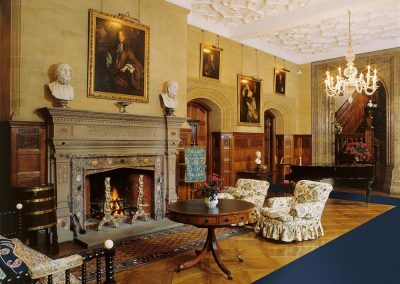 The fine seventeenth century carving of the lower part of the fireplace was once in a German monastery, until purchased and transported to England by the 6th Duke of Devonshire. 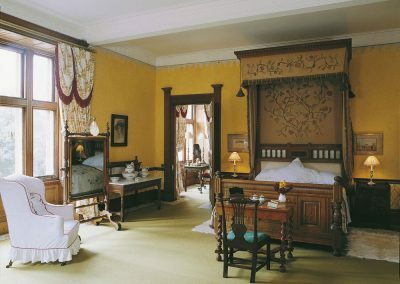 The furniture is mainly English from the nineteenth century, exceptions are a fine French Regencé bombé-fronted Kingwood commode of around 1720 and a French eighteenth century armoire, carved with musical instruments. 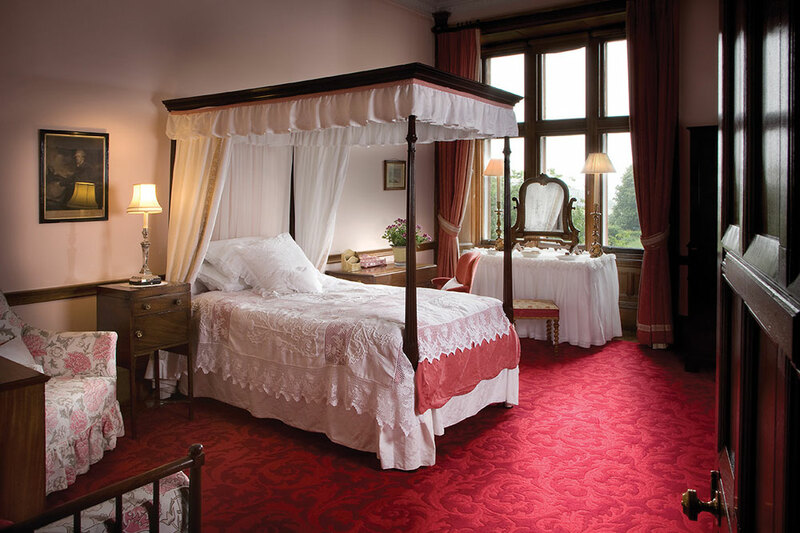 The hangings and cover of the tester bed are crewel work embroidery in a Jacobean design, worked on unbleached cotton by Lady Moyra Cavendish whose portrait in chalk by C M Ross hangs over the fireplace. 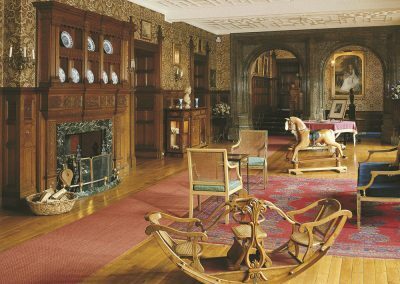 The long gallery was a feature of great Elizabethan houses, and here the idea has been interpreted by Victorian architects and craftsmen. It was in this gallery that the carpet bowls seen in the Billiard Room were used. A few days after the fire in March 1871, when it was cool enough to examine the ruins, Lord Frederick saw an Italian marble pedestal which appeared quite undamaged, but when he attempted to lift it, it disintegrated. 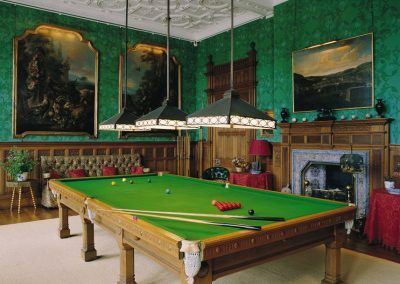 The fragments of multicoloured marble were collected and later set into the chimneypiece in this hall. 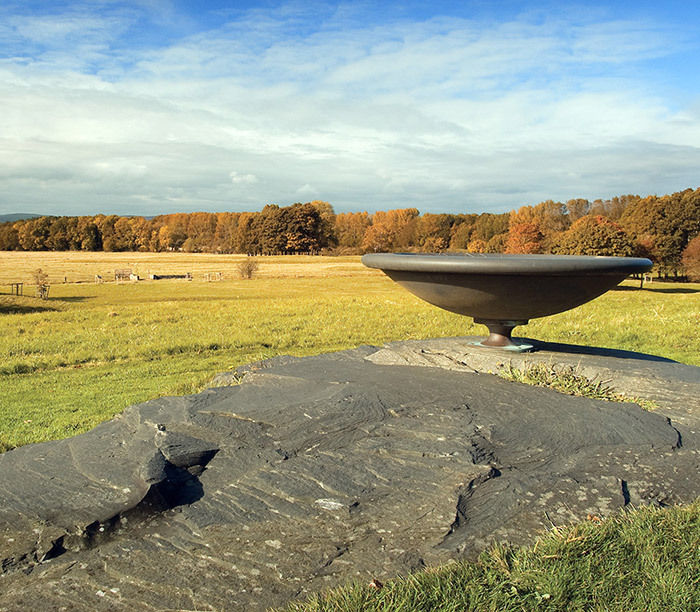 It is made in the same sandstone as the exterior of the house and inscribed with the date of the fire. 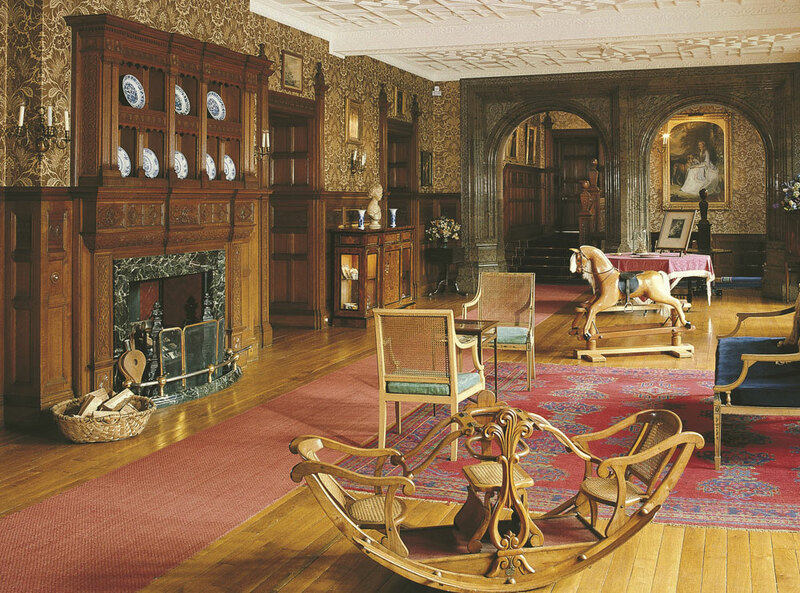 To the left of the fireplace, worked into the panelling, is the name Louisa and the date 1875, a tribute to Louisa by her father in recognition of her skill as an interior decorator in the new house at Holker.